Working with "Allo" fibre can be fitted into the domestic routine at times convenient to each individual. Biting off more than they can chew – peeling off the bark. Jobs for the boys. Modest investments in appropriate technology deliver worthwhile benefits. 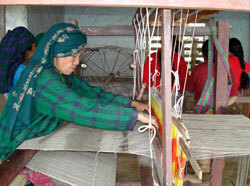 A payment of 7,500 rupees (about £60) to local craftsmen is enough to sponsor an upgrade – from a back-straining “back-strap” loom for weaving narrow strips of nettle thread, to a more comfortable wooden frame construction that can be used for making higher value cushion covers, using nettle and silk fibres. After a month’s training in knitting techniques, these village women are capable of making quality scarves and shawls. Allo Allo! What have we here? A range of hand-made items, using fibres extracted from the stems of the Giant Himalayan Nettle, known locally by the Kulung Rai hill-tribe people as “Allo”. In 2051 B.S. (1994 in our chronology), the late Sir Edmund Hillary was so convinced of the potential benefits from this natural fibre that he contributed 50,000 Rupees to the local Rai community in the foothills of Everest to pay for some basic fibre extraction tools and training. An enterprising British lady, Susi Dunsmore, has also been contributing ideas and experience of nettle fibre in Nepal for the past 25 years. 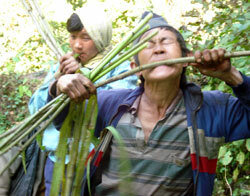 This prolific plant is woven into the very fabric of Rai culture. Its fibre is used for tying the umbilical cord of new-born babies, for wrapping dead bodies, and for many other purposes in between times, such as for making bags and clothes. An old saying in Rai culture is: “Rokchokhi maandi, Roduchim uso-toksno”, meaning “Without Allo we can do nothing. In Rai culture, we must have Allo”. Following successful pilot projects in three villages from 2004-7, Transrural is embarking on a more ambitious plan from 2010 - 15. The poverty-stricken producer communities have told us that their greatest hope is to extract more value from their natural nettle resource. The rough bags and cloth are useful, but bring in precious little cash to pay for essential food during the lean season, or for contributing towards the health and education costs for the children. The focus of the new project, therefore, is on high-value, lightweight items for marketing to people with greater buying power, as an adjunct to the low-value local market. This requires assistance at every link in the chain: appropriate harvesting techniques to ensure sustainable supplies of the raw material, more fuel-efficient retting methods for extracting the fibres, improvements in spinning to improve productivity and thread quality, consistent quality knitting according to new designs, appropriate technology wooden looms to replace the back-strap loom, secure transport from village to capital, clean storage conditions, and links to niche markets outside Nepal in such places as Japan, India and the UK. A variety of marketing methods are envisaged, including the use of the internet. Transrural has no aim to profit from the marketing side, instead taking on the role of honest broker, to establish the links between designers and producers on the one hand, and between producers and markets on the other. All this will require good organisation. 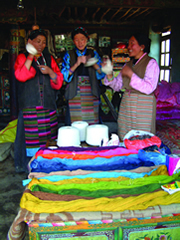 Transrural is working with a non-profit partner, the Himalaya Natural Fibre Foundation, established in 2007 to serve and represent fibre producing communities. HNFF’s committee includes leaders from these communities. Transrural is contributing to the costs of training, appropriate technology, micro-grants, market research, design, test marketing and advocacy. Some of the necessary support has been secured, and we are actively seeking funds to further develop, diversify and extend this successful project. We have checked the arithmetic, and the economics of this project do add up. Making a quality shawl from nettle and pashmina takes three times longer than making a local bag for carrying sweet potatoes, but the net return to the producer can be several times higher. Grant funding for periods since 2002 from the DFID Small Grants Scheme via the British Embassy Kathmandu; DFID Civil Society Challenge Fund for advocacy; The Clothworkers’ Foundation; the Isle of Man Government; and Transrural sponsors.